Captain Joshua Decorah Sanford will be inducted into the Wisconsin Aviation Hall of Fame on October 20, 2018, in Oshkosh, Wisconsin. Joshua Sanford was the only Native American that flew for the famed Flying Tigers and survived World War II. Sanford was born near Friendship, Wisconsin on January 19, 1919, to Maude L. Decorah and Herbert W. Sanford. His mother was Ho-Chunk. His father was a Seneca from Cayuga County, New York and a graduate of Cornell University. They divorced while Joshua was still quite young. Sanford grew up in the Richland Center area and was an active young man, participating in sports, mowing lawns, and shoveling snow. Richland Center is less than ten miles from Lone Rock, where the Civil Aeronautics Agency had an emergency field for airlines traveling between Chicago and Minneapolis. The field staffed a Flight Service Station and was a junction of mail routes used by airmail carriers in the early 1920s. Joshua Decorah Sanford graduated from Viroqua High School in 1936 and then entered the University of Wisconsin - Madison. Before he completed his education there, he enlisted in the U.S. Army Air Corps on November 4, 1940. He was selected for pilot training. Sanford was commissioned a Second Lieutenant and awarded his wings January 1943. His first assignment out of pilot training was to the 14th Army Air Corps Flying Tigers under General Claire Chennaulte’s command in China. Joshua Sanford was attached to the 75th Fighter Squadron, 23rd Fighter Group. The original All Volunteer Group (AVG) Flying Tigers were disbanded on July 4, 1942. The 14th Army Air Corps was assigned the China Theatre and carried on with the AVG Flying Tigers’ mission. According to Tomas J. Thomas’ November 2, 2001 presentation in Baraboo, Wisconsin, The Mission of the 14th Air Force was to: (1) Defend its own lifelines over the Hump; (2) Ferret out and destroy Japanese aircraft and troop concentrations; (3) Destroy the enemy’s military and naval installations in China; (4) Smash and disrupt Japanese shipping along the China coast and beyond and on the numerous inland waterways in China; (5) Destroy enemy supplies and military installations in Indochina, Thailand, Burma and Formosa; and (6) Encourage Chinese resistance and provide all possible aerial support to their ground forces. “We were on alert, me assigned as No. 2 in Chief’s four-ship flight. The weather was lousy, low clouds and drizzling. But along the morning came orders to go. A Jap cavalry column was moving south and threatening the Chinese defenders of Changsha. We took off carrying .50-caliber ammo and parafrag bombs, all but standard for anti-personnel missions. We tried to form up in a finger-four pattern, but the clouds were too low. Chief was following the river northward and having to do lots of twisting and turning to stay in its course: there were hills on both sides reaching into the clouds. We just stayed in line astern. Up past Changsha, Chief suddenly headed inland away from the river. I was appalled. The ‘road’ we had been briefed to follow was nothing but a path of stepping stones, common in Central China. And the weather wasn’t getting better. Chief hung to that footpath like a bird dog. I thought he was nuts, just wasting time and gas, but I wasn’t about to say anything. We had to thread the needle through several passes, the clouds down almost to the ground. I couldn’t imagine how Chief could stay with that footpath and be sure it was the right one. It was all we do to just stay with him. After twenty or thirty minutes I was getting disgusted. We hadn’t seen a sign of the enemy activity and getting further into weather trouble by the minute. But suddenly we topped one last low pass – and there they were! It was mounted troop of horse cavalry, caught absolutely flat footed. Joshua Sanford flew 102 combat missions between 1942 and 1945, awarded two Distinguished Flying Crosses, two Air Medals, two Purple Hearts, five campaign ribbons, and presidential and unit citations. He believed to have shot down eight enemy aircraft and official record documents one confirmed kill. Joshua was shot down or ditched 12 times. He flew North American T-6 Texan, Curtiss P-40 Warhawk, and North American P-51 Mustang. Joshua Decorah Sanford’s focus turned to his Ho-Chunk Nation people and fought for their rights. The Indian Reorganization Act of June 18, 1934, was a United States federal legislation aimed at restoring to Native Americans the management of their assets. The main goal was to reverse assimilation into American society and to strengthen, encourage, and perpetuate tribes. Twelve years later, the government passed the Indian Claims Commission Act. This sought to compensate tribes for claims they had against the U.S. government. The Wisconsin Winnebago (now Ho-Chunk Nation) formed a claims committee in 1949. This committee would become the seed for current Ho-Chunk Nation government. According to an article by Helen Miner Miller, appearing in issue 2 of 2012 Hocak Worak, this claims committee included LaVern Carrimon, Nathaniel Decorah, Robinson Johnson, Joshua Sanford, and Reverend Mitchell Whiterabbit. At a General Council meeting in 1961 in Tomah, Wisconsin, the provisional Wisconsin Winnebago Business Committee added Richard Day, Lyle Greendeer, Angelo LaMere, Gilbert Lowe, May WhiteEagle Natani, James S. Smoke, Bernadine Tallmadge, Floyd WhiteEagle, and Helen Miner Miller to the five who served on the claims committee. Sanford returned to Hillsboro and owned an electronics firm. He then moved to Reedsburg in 1956 and managed the Wisconsin Municipal Airport there. Then he was appointed Civil Defense Director for an 11-county area of Southwestern Wisconsin in August of 1961. Joshua Decorah Sanford died on October 21, 1962. He was age 43. Acknowledgment of his accomplishments wouldn't end there. 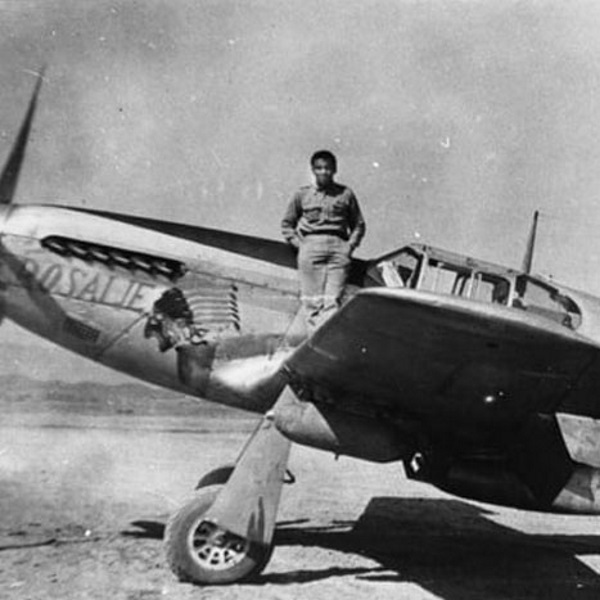 Thirty years after World War II, China awarded the Flying Tigers the China War Memorial Medal. Joshua Sanford received his posthumously. In his honor, the Hillsboro community named its airport ‘The Captain Joshua Sanford Airport’. According to Phil Peterson’s article titled ‘A Final Salute to Joshua Sanford Field, Hillsboro, Wisconsin’, local Hillsboro resident, Richard Sweeney, was instrumental in getting the airport named this in 1993. In 2016, a brick commemorating the memory of Joshua Sanford is dedicated at the Memorial Wall next to the EAA AirVenture Museum in Oshkosh, Wisconsin. Joshua Sanford is one of four aviators that will be inducted into the Wisconsin Aviation Hall of Fame on Saturday, October 20, 2018. According to WisconsinAviationHallofFame.org website, Jerome LeBarron, Janis Sierra, Joshua Sanford, and Donald Winkler will be honored at the induction ceremony for their significant contributions to aviation in Wisconsin. The induction ceremony will be held at the EAA Aviation Museum in Oshkosh, Wisconsin. Inductees’ family, friends, and the public are invited to attend.